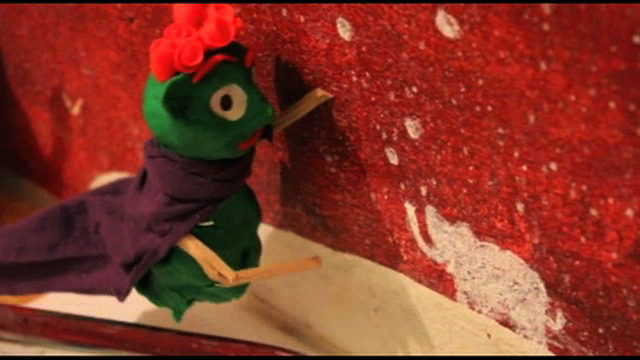 A short movie developed and realized with Songül Sonmez. Produced in the frame of “Strangers At Home”, a project by the The Global Reporting Centre. When I was little one of my favorite books was called Hatschi Bratschis Luftballon by Franz Karl Ginzkey. It was a hardcover book with colourful drawings and wonderful melodic rhymes. The book’s story is about a boy called Fritzchen who does not listen to his mother and plays outdoor in the surroundings of his village somewhere in Middle Europe. While playing carelessly, he does not notice the red air balloon approaching him from the sky. It is Hadji Bradji, the evil sorcerer from the Orient, who comes to steal children. He travels in an air balloon, which is attached to a gondola that looks just like the up-side-down rooftop of a mosque. Hadji Bradji has a massive body, dark eyes, a huge beard and he smokes a pipe while searching for children with his telescope. Hadji Bradji catches Fritzchen but soon the crescent of his mosque-rooftop-air-balloon entangles with the cross of the village’s church and the sorcerer falls out of the balloon into the deep well. Twenty years later I am a university student and spend one semester in Istanbul on an Erasmus exchange. I remember the book of my childhood and tell the story to my Turkish friends. They find it hilarious and don’t stop laughing about the mosque-rooftop-air-balloon. They explain me that the author most probably got inspired by a practice of the Ottoman Empire called devşirme (collecting). Christian children were collected from villages of the Balkans and got trained for the military service of the Empire. The evil sorcerers name could derive from the Arabic word hajji, which is an honorific title given to a Muslim person, who has completed the pilgrimage to Mecca. On February 25th 2015 the Austrian parliament passes a new Islam law which fails to treat Muslims equally and rather reflects the widespread mistrusts of Muslims in Austria. How strong is Hadji Bradji, the evil sorcerer of the orient embedded in our heads? Do we picture the so called islamization of the occident like a red air balloon which brings shadows on our green grass? BLÜEMA is a short movie that I produced in collaboration with Désirée Meul for the fourth birthday of my cousin Florentina. The protagonist of the movie is Blüema, a green play dough figure, who sets on an adventurous journey through my apartment in Berlin. For Florentina’s birthday Blüema, the movie and I travelled to the countryside in Austria to bridge the gap between our different worlds. Combining a two-dimensional movie to watch side by side with a three-dimensional figure to play together.